Please do not use Status Updates to ask support questions, that is not their purpose. Please post a thread in Useful Development Tools. If you search that section you will find some answers already. I just started studying to pass the entrance exam for national college... And I only got one month ;-; Please wish me luck! Marsigne, Kaeki, shadefoundry and 1 other person like this. So does that make them a necromancer? Marsigne, SpaceBot and Tonko like this. Snow White and SpaceBot like this. According to the rule 5.4, I would not be able to "advertise" a discord server. But, is there any way to invite without breaking the rules? You can do it through pms, as long as you're not just messaging random people asking them to join. The Stranger and Tonko like this. cabfe and Jonforum like this. @cabfe Exactly. Specially when they solve it by themselves but don´t give a clue on how. Or "my game just crashed with a random error, how do I fix the error?" Alright, even if I got 0 experience, 0 skills and 17 years without trying already, I am going to try to learn how to draw. Wish me luck! starlight dream, Marsigne, Gabrelik and 2 others like this. Then in Yugioh GX there was a guy that knew the power of draw, but that means he just knew what he was going to draw. In the duel with Jaden though he panicked in one turn and focused on what he must draw, not what he's going to draw (instead of this logical explanation though, Jaden(Judai) just said "it's impossible to always know what you'll draw" after that). Snow White and Tonko like this. The rest of them was just a plot convenience - in the first season of Yugioh it was called Heart of the cards, but it disappeared as soon as in season 2. Just like the fact that selfish people never win regardless of experience - in GX everybody fights for their own selfish reasons. And ygo duel links is just a complete load of bull showing how pitiful Yugioh is to this day. Characters have special duelist abilities and build otk decks based on them. The evening might be best if it's for support-related threads. If it's a game, it might not matter unless you have an audience already. Parallax mapping will be a headache after the GIMP interface update... The new photoshop looking style is just very annoying to my eyes. Davekron, The Stranger and Sauteed_Onion like this. Slower start up? It was already too slow. Hmm, this might be a dealbreaker, I might not update after all. Tonko and The Stranger like this. @Sharm That's what it feels like. It does have some nice new features, though. Yeah, there are some nice new features, but I personally think it's not worth it. Might try to find a way to downgrade. If I wanna ask about how could I have RPG Maker MV in a pendrive and some other technical questions; Should that be in support? Or OffTopic? Off Topic is really intended for anything not game development related. If it is game development related, most often it should not be in Off Topic. So, I would put it in MV Support and if we feel, based on the direction of the conversation, it needs to be elsewhere, we will move to the correct place. Or you could just search 'cause it's been asked before. Would avoid the straight edges on the pond and line of trees across the borders of the map. Sauteed_Onion and Tonko like this. 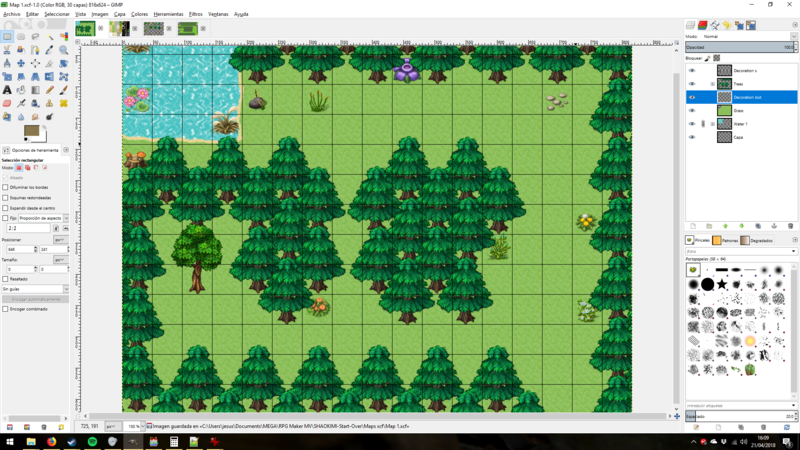 @Milennin Yep, fixed that with some tileset tricks. I'm currently utilizing the Chrono Engine for an ABS. It is a very steep learning curve, but the investment of time has certainly been worth it. The project is coming together quite nicely, and I'm really enjoying the power of this plugin. Really just depends on how committed you are to getting it down. Wow, it has been a while since the last time I have been here! Tonko and starlight dream like this.